Last night I was just about to fall asleep and was lost in thought when several gunshots rang out in rapid succession. I’ve shot enough guns to know from the sound it was a handgun and it was close. I mean within fifty yards close. But I looked outside, saw nothing going on and heard no cries for help or other sounds of commotion. I figured it was some idiot firing off shots in a populated area but quickly the cops swarmed the scene and I got a phone call. “Kevin,” a very shaken voice said over the phone, “We just had bullets come through our wall.” This was a friend of mine and fellow student who lived in my apartment complex. I got dressed and went over to their apartment just as the police were fanning out from their cars. I waved to one, calling out that it was not an emergency but I needed someone to come over to investigate. I figured a ricochet or stray bullet or two had hit their wall. When I finally got over to my friend’s apartment with the officer that came with me I found them visibly shaking and terrified. As I saw the scene with my own eyes I realized it was not just an accident. 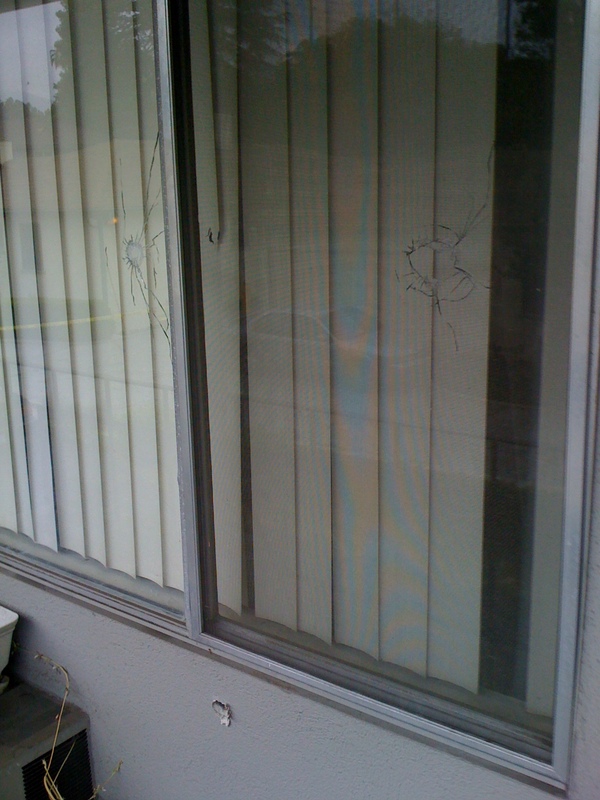 Someone standing in our community driveway had unloaded nine shots very directly into their apartment, hitting their outside wall, their air-conditioner unit and their window. While some bullets had been stopped outside, some of them had passed through. One of the roomates had been sitting in the living room when shots came tearing in from outside. I gave my friends comforting hugs but left them with the police as I quickly turned my attention to others in the community. I was really scared for some other friends as everyone else had responded to their doors being knocked on by police except for them. Their cars were home so they should have been inside their apartment but they were not answering their phones or knocks on the door. It was hard to hear over the din of the police helicopter but for a moment I swore I heard a woman crying. While there were no bullet holes in their apartment I began to fear if something worse had happened to them or if there was even an intruder in their apartment. While normally such a fear would seem irrational an hour earlier the thought of someone intentionally targeting an apartment in my complex was beyond the pale. Eventually they finally woke up and responded to the police banging at their door. My roommate and I opened up our apartment for our neighbors to just sit together and talk until everything calmed down. While one of my friends whose apartment was targeted was picked up by her boyfriend we let the other one sleep in our apartment last night. Just a few hours earlier I was at Pihop and in describing her ministry a young woman said that while many people treat L.A. like Sodom and Gomorrah she saw it at least Nineveh, and there were a bunch of Jonah’s in the room called to call it to repentance. Much was said that night about lovingly engaging with the city. The words of Ray Bakke came to mind. Bakke described cities as “people containers.” Cities were containers of the image of God and were therefore deserving of our love not our condemnation. In a reaction against a Christianity primarily concerned with providing moral direction to people pursuing the American Dream and a dissatisfaction with a common Christian bias against urban centers, there is a movemoent among some Christians to intentionally move into more impoverished areas of cities and urban centers to impact the community by modeling Christ’s life and love. Such Christians believe that Christians are to be salt and light in our world and it is hard to do that from safe gated communities often disconnected from the rest of the world. These beliefs and practices would be downward mobility and incarnational ministry respectively, and they have existed in Christian traditions throughout the centuries in some form or another. While I applaud this movement and have been a part of it, I caution anyone from thinking downward mobility or incarnational ministry is a safe endeavor. We should not allow our great intentions to shroud the reality of the situation. Like any worthwhile endeavor for the Kingdom of God, living in urban centers to love people will involve uncertainty, danger and personal sacrifice. Phyllis Tickle, in a recent talk at Fuller, highlighted the fact that living in urban centers inherently involves putting oneself and one’s family at risk to things that could be avoided by simply living elsewhere. Those in our community were reminded of these dangers nine times last night. Before coming to Fuller I lived in West Modesto, an under-served area of my hometown that I had historically avoided. When I moved to West Modesto from the suburbs it took a couple of months to get used to gunshots randomly ringing out some nights. To the youth that I worked with, this was taken for granted because this was the world they grew up in. This is the world most people have grown up in. I had to square myself with the fact that a stray bullet could come through the window. As a bit of an aside, can I just say that it strikes me as very odd that for some incredibly affluent Christians it is actually a conscious choice to live in an impoverished and dangerous area or not. We are so blessed we actually get to choose if we are exposed to the dangers that are just the facts of life for most people in this world. I fear that the practice of downward mobility, which is inherently laced with privilege, is for some just a new fad, as cliché and ubiquitous as flannel wearing hipster pastors with forearm tattoos, and may even become a source of faux-piety. Because of the incredible abundance and wealth we were raised in I fear many of my peers have come to believe they actually deserve a comfortable standard of living by the universe and by God. Armed with this delusion, some people can actually think that by stepping down into the world most people live in, that they can practically speaking leave at any time, they are actually sacrificing something big to God and are the spiritual elite of this world. How patronizing. When the risks of urban living are actually experienced, this will separate those for whom incarnational ministry is a fad from those for whom this decision is an outgrowth of deep spiritual convictions. When I was coming to Pasadena, I was warned that the area I was moving into, the Pasadena north of the 210, was dangerous. While I have occasionally worried about a stray bullet coming through my paper-thin wall (which faces a very busy street) I never imagined something like this would happen. In the Fall I was thinking about moving onto campus to save gas and because my life was increasingly centered on Fuller campus. However, because of involvement at Pihop and because I keep hearing great things about a church almost literally next door I began to reconsider this decision. After last night it appears clear that this area of town needs Christians more than Fuller housing does. I know that my answer to the two questions posed to me last night, if incarnational ministry is worth it and if I trust Jesus, will at least in part be answered by where I end up living in the next year. I want to end this post with two pictures that highlight what I know Chuck Miller would call the “holy tension” I am faced with. 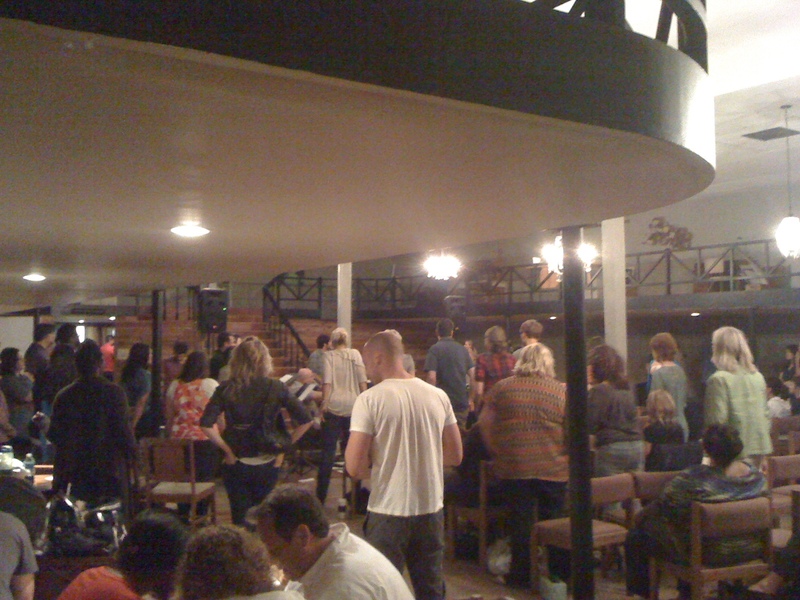 The first image was taken at Pihop last night where we prayed boldly about loving the city around us. The second image was taken this morning and is a reminder of the stark realities of living in the city I believe we are called to love. This entry was posted in Faith and tagged Christian life, Christianity, cities, downward mobility, incarnational ministry, ministry, Ray Bakke, risk, shooting, urban, urban areas, urban life. Bookmark the permalink. I’ve been thinking about that concept: downward mobility and it’s relationship to privilege. Excellent point. I think too, that the suburbs can be just as dangerous as an urban area but in a different way: we are lured into the worldview that espouses that everything is okay when the American Dream is attained. Different kinds of dangerous.